Ah, the New Year is upon us. Most of our resolutions revolve around grabbing hold with a death-grip and vowing to never let go. When it comes to losing weight, getting out of debt, or discovering if our closets actually have floors? This is a good plan. Yet, when it comes to our careers? Never giving up might keep us from ever succeeding. Want to know the secret to success? Quitting. Yes, you heard me correctly. And, if you’re a creative professional, it is in your interest to learn to get really good at quitting. Maybe you’ve felt like a loser or a failure, that your dream to make a living with your art was a fool’s errand. It all started with the DFW Writer’s Workshop. I attended and met people living the life I wanted to have…the life of a professional writer. They were the same as me, and yet very different. When I went to DFW’s conference–which I HIGHLY recommend so sign up NOW for the May conference (I will be there, oh and Donald Maass and Les Edgerton, too)–I found myself being pushed to yet a higher level. I met and stalked Candy Havens. Candy is an excellent quitter. She wrote her first bad book and didn’t spend the next six years trying to resurrect it. She sought training and experts and moved forward. She quit outside hobbies and friends that took away from her goal of becoming a professional author. Theresa Ragan was rejected by traditional publishers for over twenty years. She finally self-published and has now sold hundreds of thousands of books. NY tried to offer her a contract and she turned them down. 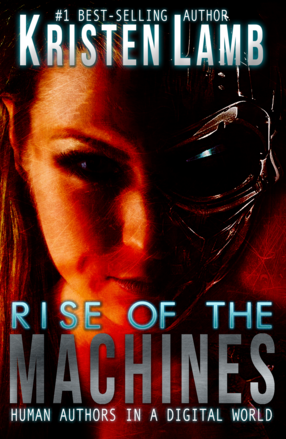 I turned in a hundred page proposal for Rise of the Machines—Human Authors in a Digital World in the summer of 2011. But, after NY ignoring it for over two years? I published it myself. We need to always be moving forward, and sometimes pressing on requires letting go. We can’t grab hold of the new if we are hanging on to the old. A couple years ago, I presented at the North Texas RWA Conference and I heard the best term EVER. No aspiring writers, only pre-published writers. If you want to be a professional author, you must quit to win. The day job is no longer the ends, but rather the means. The day job is just venture capital funding the successful art-making business…YOU. December’s Winner is Chris Weston. Please send 5 page synopsis (1250 words) one page query (250 words) or 20 pages of novel (5,000 words) in a WORD document to kristen at wan intl dot com and congratulations. The “False Alarms” from the movie Labyrinth. If you’re a writer, then you have a dream. You also have a lot of work ahead. I heard an interesting quote this morning from Joyce Meyers. There are dreamers who don’t work and workers who don’t dream. That hit home for me. After having been around the block a few times, I can say I’ve met both types of writers. Some writers have all these ideas and generally a stack of unfinished work to show for it. They aren’t willing to dig in when it gets hard, when the “fair-weather friends” fall away. On the other side, we have those who write, but are afraid to dream. They’re terrified to dare ask if they could be great. To be successful we must learn to dream and to be finishers. Starting is easy. There are a lot of people to cheer us on, but watch what happens when the heat turns up? Most fall away. To be successful, we must remain focused so we can remain standing at the end (often alone). Win, lose, or draw, if we finish? We’ve still won. Many of you who’ve followed my blog any length of time know I like to pick on my first novel. It’s now chained in the garage and keeps burglars away. I thought it was going to be an instant runaway success, and my largest concern? Learning the craft? *giggles* You guys are funny. No, my largest concern was how to handle all the agents that surely would be fighting over this “masterpiece.” Time, experience and failure gave me a solid pop on the snoot and a hard dose of reality. Sure, I’d written a book so bad it was banned by the Hague Convention as torture, but, for the first time in my life? Yes, the book was an unfixable mess, but it was a big first step in an entirely new direction. When you lock on your dream, you must be centered in what you want and who you are. One of my favorite scenes from the movie Labyrinth is when Hoggle is guiding Sarah out of a jam (the oubliette) and they head down a passage with talking stone faces saying things like, You’re going the wrong way! Turn Back! Soon, it will be too late! Hoggle tells Sarah to ignore them, that they are false alarms put there to scare people heading the right direction. We just finished the second WANACon and it was FABULOUS. Words cannot describe the experience. It is SO surreal to be in a class and having fun from home, in jammies while learning from top experts…in the company of other writers from all over the world. We had attendees from Saudi Arabia, Australia, New Zealand, Europe, Canada and the entire continental US, all in the same virtual classroom. I cannot tell you how many people told me a conference like WANACon was impossible. I’ve had people quit with no notice. I’ve had contractors take money and then disappear. But by grace and support from the WANAs? I’m still here :D.
I can guarantee you that, every time I attempt to do anything BIG (teach a class, publish a book, host a worldwide digital conference), about two weeks before go-time? All hell breaks loose. Know who you are and what you want and focus on that. Focus on the people who still believe in you (because we CANNOT be successful alone—*waves to Jay Donovan, Jamie Gold, all the WANA volunteers and the wonderful speakers and attendees*). Criticism will always come to those attempting anything remarkable. In fact, the only way to completely avoid criticism is to never attempt anything interesting. Criticism isn’t always bad. It can help us grow and learn where we need to come up higher. Often, those who criticize aren’t very skilled at it, so don’t expect it to come with a bouquet of flowers. But, we do need to sift through the hurtful stuff for the gold. People want answers, not excuses. It is perfectly okay to not know everything. And, guess what? It’s okay to be learning, to not be perfect. We have to remain grounded in where we’re going and what we want. There will ALWAYS be people to point out where we fall short, because criticism is easy. Acknowledge it, work on it, but remind yourself that there are areas you DO shine. Doormats take everything to heart and, as a result, just lay there and collect dirt. We DO need to take action when possible, even if that action is as simple as vowing to do better the next time. Be proactive, not reactive. Drama Queens are reactive. They plunge ahead with rash emotional decisions (often to their own demise). Take time to calm down, then press forward. No decision is better than bad emotional decisions. Men? You’ll just have to use your imagination here. I can attest that when I first got pregnant, it was awesome. I glowed. I got to have fun shopping for all kinds of cutesy baby things. By month TEN? The Spawn had to be evicted, even though he’d already ordered his Ikea futon and digital streaming cable. He liked the Mexican food he regularly ordered being delivered instantly and had no intentions of changing the plan. Mommy was DYING. I couldn’t sit, or sleep or think (I could only run to pee every three minutes). I hurt everywhere and I didn’t care what they had to do if I could just get THAT STUBBORN BABY out into the world. And it would have been great if they’d invented a Newborn Transporter System, but they HADN’T. So I had 98 hours of induced LABOR. By the time Spawn came into this world, I looked like I’d gone a round or two with Mike Tyson. But it was ALL worth it. Once you have that baby (or dream), it’s funny how soon you forget the pain. You forget the fear, the doubt, the thoughts of Okay, exactly HOW is that baby going to get from IN HERE to OUT THERE? But, remember, babies aren’t born Day Three. We get nine or even ten months to adjust and take on more struggles (like not being able to see your feet). Same with a book or even an on-line writing conference. Take it a step at a time. Breathe. Focus on the “baby” and do your part. In the end? You get no sleep and to change diapers revisions and all the tough steps to publication. But if you press, you gain the joy of holding that dream in your hand and knowing you toughed it out. What are your thoughts? Do you have a hard time finishing? Do you fall prey to self-doubt? Outside criticism? Do you have to watch letting outsiders discourage you? Did you finally hold your finished book in your hand and forget all the trauma? Announcements: There are a handful of people waiting on their 5-Page revisions. My goal is to have those finished by tomorrow. Between a stomach flu and WANACon, I am running behind and I didn’t have enough brain power to do your pages justice. I’d rather be a little late than return junk. I want to give your work 1000%. I am also FRIED from working all weekend, so I will announce September’s contest winner on WEDNESDAY. Yes, Kristen IS human.